Essington Fruit Farm, in simple terms, is a playground for the green fingered amongst us and food enthusiasts. My fingers were positively glowing a shade of leafy green as I ploughed through weeds and picked through plants, all in a bid to find the perfect strawberry. 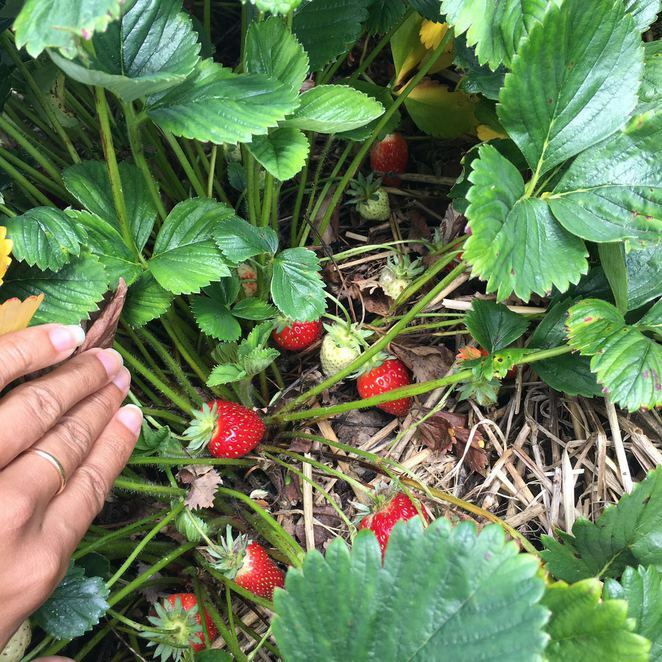 My sisters and I were suddenly eagle-eyed as we spotted unshaded giant strawberries - the first fruits we could find after a 10-minute search for other fruits on offer at the Farm. We then grabbed up our baskets - opposite the board - and had a look in the fruit and vegetable patches, which were in fact large fields. There isn't much signage, which allows groups to get lost together - part of the fun in my opinion - but there is a small signpost on some of the tayberry and blackberry bushes. Note it is too early in the UK for blackberries, but we did spot a few raspberries. The first fruit we stumbled on was a strawberry, after noting other groups rooting around certain areas, so we did the same and found an absolute array of darling berries, it was such fun. They ranged in size from tiny, to large, fat and sort of squashed to heavily-seeded and not-so-ripe ones. My family and I weren't the only ones to delight in the fruits of our efforts; we saw larger groups of adults and little ones having as much fun, with a group of kids often beckoning their parents to help them uncover fruits they'd also found, keen to take their bounty. 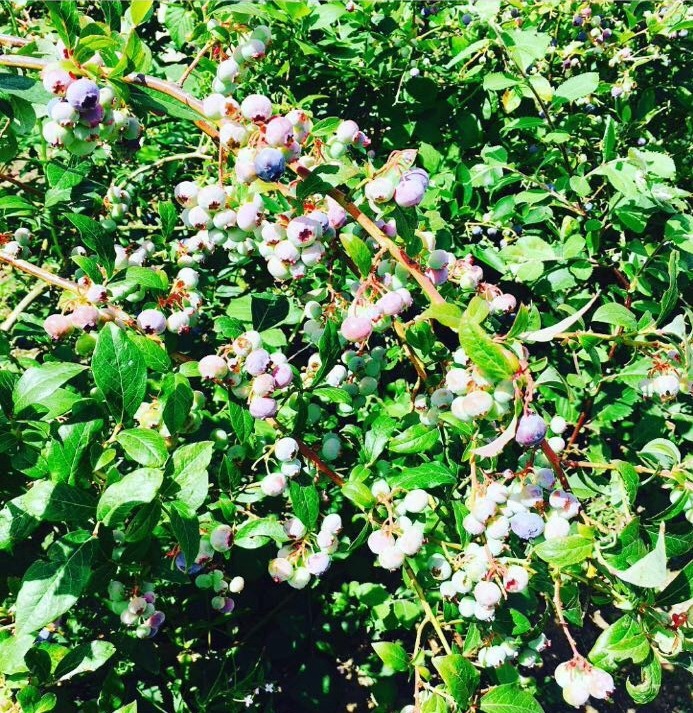 We then moved on to the other bushes where we spotted very few raspberries, along with a tiny bunny rabbit resting amongst the bushes, and then blueberries, which were a surprising pinky-lilac. It is such fun, especially with kids, as we saw, trying to find the ripe, darker purple ones. I'll warn you now however, Essington Farm isn't a small place, and you need to be prepared for a decent walk about. It's not huge, but it is a farm. Your feet may get a tad muddy, also. I was fine in my Keds, and my Mom didn't complain about dirty feet in her flip flops, but if you have wellington boots, wear them. Admittedly, we didn't walk away with a huge amount of groceries, and even on our way back to the shop, to pay for our goods, we spotted a patch of cauliflower and cabbages, but we needn't have fret: the farm shop is rich with vegetables all grown on the farm, along with locally-made cheeses, cured meats, and other deli delights such as speciality oils and artisan hand-crafted cakes. Essington Farm is definitely one for the weekend, even though it is open during the week, but we spent a solid four hours there, including our comfort-food lunch.